People alive with the blessings of sunlight. The sunlight includes many kinds of lights but usually people can see only a few of those. They see colors of the rainbow through a drop of water. The rainbow has six or seven colors in a general way. Actually, layer of many colors makes a beautiful arc of the rainbow. It appears in the sky after a rain. various cultures. 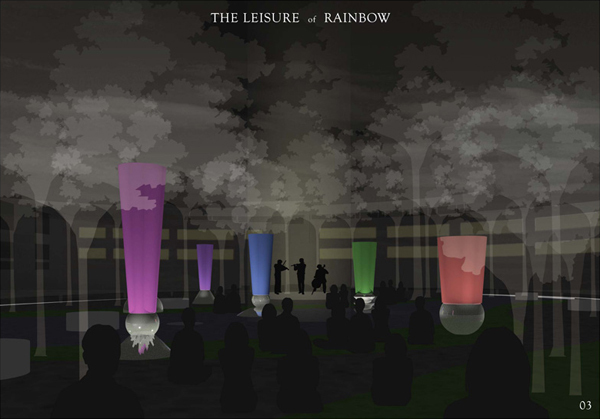 “The Leisure of Rainbow” seven sculpture has humourous and friendlly shapes rather than a magnificent sculpture. This sculptures, the soil, the stone, the wind, the green…all of those are elements in space of “Feel Good”. This plan has a imaginary view. Here is a place that take a body and soul’s rest. The place welcomes any patients, any staffs and any local people. They can walk around, take leisurely times and relax. 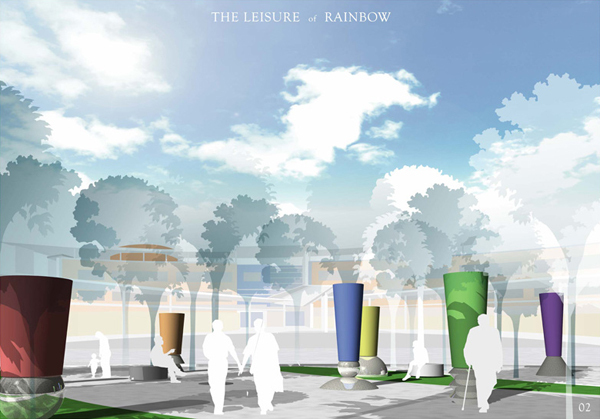 Seven rainbow sculptures will always be here and sometimes they are looked at, sometimes they are audiences in events. accents the space. In daily life, there will be the place for rest. My proposal suppose to this stage to hold events. I shall proposal to plant with trees that bloom fragrant flowers. a cherry blossom, an apple tree, a rose, a narcissus, a lily, a lavender, a thyme… people will notice their fragrance and look at back this area. Then, people will may feel at ease. Seven light are in green space. They changes their expression by sunlight, day by day. Every hour sunlight will changes color. That process like tide. Every soft breeze will rustle through the trees in this space. These nature’s element will make brilliant time and space for the people. 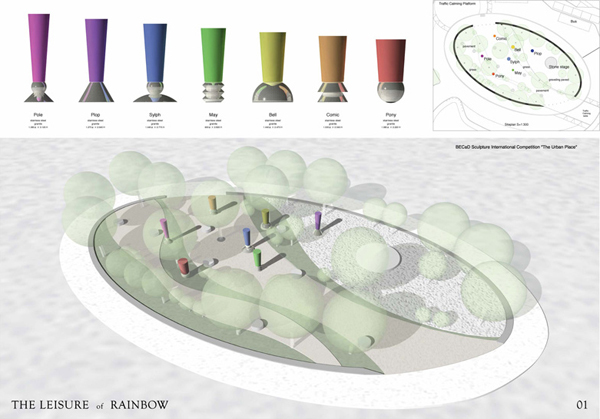 So my proposal makes great harmony among environment and people. One sculpture appear clearly and other is half hidden among the trees. A series of appearance like that, those are opportunity for the people to imagine any thing like.